Garrett is all smiles after taking charge. Switching a coach midseason is never easy. We just need to take a look at history to see that it rarely goes well. But, there are very few success stories of teams turning their season around after making a coaching change midseason. One of the more recent example of success was Mike Singletary and the 49ers. In 2008, the 49ers got off to a ugly 2-5 start. Head coach Mike Nolan was given his walking papers and the inexperienced Mike Singletary took over. “Iron Mike” led the 49ers to a 5-4 record the rest of the way, finishing the season 7-9. Although, for every success story there are 3 or 4 failures. That is what makes this Cowboys season so intriguing. The Cowboys were 1-7 when they decided to part ways with Wade Phillips. But, the consensus around the league and in the organization was that the Cowboys were a far better team and that clearly the coaches weren’t getting through to the players. 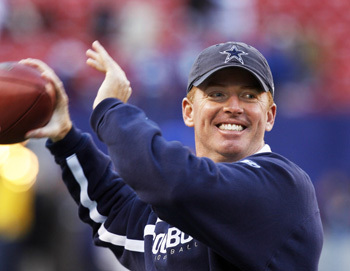 After Phillips was let go, offensive co-ordinator, Jason Garrett picked up the reigns and has taken charge on an interim basis. I think it is fair to say that after three games there is quite a noticeable difference in this Cowboys team. Garrett inherited a team that had given up at least 35 points in the three previous games to his takeover. He inherited a team that was 31st in the league in rushing, after finishing 2nd the year before. He inherited a team without it’s premier quarterback who won’t be back for at least another two weeks. Finally, he inherited a team that lacked confidence, swagger, and a desire to get off the mat. Fast forward three weeks and the Cowboys have looked completely different both on the field and in the locker room. Players are smiling, enjoying the opportunity to play. Garrett has the team focused on taking it one day at a time and having a “work” mentality. Maybe the most important part, is Garrett has this team winning again. Now, I know the Cowboys dropped one to the Saints on Thanksgiving, but, the Saints are the defending Super Bowl champions and it took a “brain dead” play from Roy Williams to allow the Saints to win. 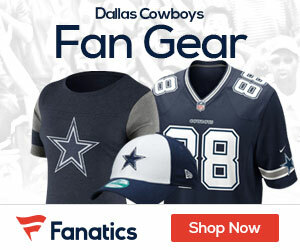 The Cowboys knocked off their hated rival the New York Giants, in New York three weeks ago. The Giants entered that game the hottest team in the NFL. They had won five games in a row heading into that rematch, including a 41-35 whipping of the Cowboys where the score makes it seem a lot closer than it was. Garrett and the Cowboys followed that up with a 35-19 beat down of the vastly improved Lions at home. While they looked bad in the first half, the Cowboys erupted in the second. This just seems like a different team to me. Garrett has taken the Cowboys from 31st in the league in rushing to 27th. They are averaging 14 yards a game on the ground more in only a three game span. That is the start of a remarkable turnaround. In the meantime, the passing offense has only dropped 10 yards a game, and fourth to fifth in the league. The defense has had the biggest turnaround. After allowing at least 24 points in six of their first eight games, the Cowboys have held opponents to 20 or less in two of their last three, the one exception is the potent Saints. It is clear that Jason Garrett has brought a different attitude to this team. I’m not sure I’m ready to declare him the next coach of the Cowboys. I’m not even sure the Cowboys are allowed to make that declaration with the existing NFL hiring rules. But, if the Cowboys keep playing improved, I think it is safe to say that Jerry Jones will have found his coach for next year. The Cowboys face a horrendous schedule the rest of the way, starting this week against the Colts in Indianapolis. They have two games against the detested Eagles, and one more against the Redskins. Sprinkle a game against Arizona in Phoenix and the Cowboys have a tough road to hoe. But if the Cowboys keep playing the way they have the last few weeks they should have a chance to win in each of those games. It might be too much to think that they can finish 8-8 and go perfect the rest of the way. But if they can get to 6 or 7 wins, that has to be considered a solid turnaround. It also might be enough for Jason Garrett to take over the reigns and remove the “interim” tag from his title.